Celebrate the Halloween season with tricks, treats, and jewelry techniques! That's right; we're getting in the Halloween spirit with some fun and festive jewelry crafts for Halloween. Other than the spooks and the sweets, the most important part of Halloween is getting dressed up, and what better way to show your Halloween spirit all season long than with some devilishly delightful jewelry designs? From black cats to candy corn, scary skulls to plump pumpkins, these jewelry crafts for Halloween cover the entire spooky spectrum. Whether you'll be haunting the streets of your neighborhood on All Hallow's Eve or handing out treats to the little ghouls and goblins who come knocking at your door, you'll want to get in on the frightful fun this October 31st. From the cute to the creepy, these jewelry crafts are the perfect way to be a little playful with your Halloween ensemble. You'll look forward to digging out these festive pieces from the dark depths of your jewelry box each year as the autumn air turns cool and crisp. But that's not all! What would the Halloween holiday be without some tasty treats to tantalize your taste buds? We've throw in a special bonus for all of you who love a good treat as much as a good jewelry tutorial. Stick around to the end of this festive list of free jewelry patterns to be rewarded with some fanciful and frightful Halloween food recipes! For those of you with a more macabre sense of Halloween style, these skull-themed jewelry crafts will be right up your alley. No bones about it; these are some frightfully fabulous jewelry patterns, petrifyingly perfect for the Halloween-loving fashionista with a bit of an edgy side. Plus, skulls are just a classic for Halloween jewelry! If you don't have any in your DIY collection by now, then you really need to get crafting! These cute jewelry crafts for Halloween all feature the ever-popular pumpkin motif! 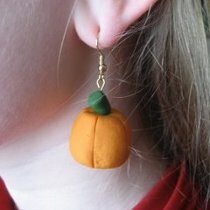 Find three different techniques for creating perfect pumpkin jewelry among these free jewelry patterns. Nothing to fear here; the tutorials will walk you through step by step. Does your Halloween costume need a little something extra? If it does, try making any one of these 17 Spooky Chic Jewelry Projects for Homemade Halloween Costumes. Your costume will instantaneously look more festive! There is so much more to Halloween than just your typical skulls and pumpkins that you alwasy see! If skulls and pumpkins don't strike a chord with you, peruse these Halloween jewelry crafts for a project that tickles your fancy. These Halloween-themed odds and ends range from the cute to the macabre, so there's something for everyone here! So get ready to spook your friends in a whole new way with these awesome jewelry tutorials. 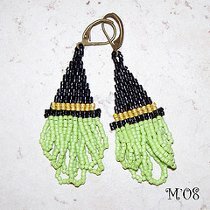 Do you like unique and one-of-a-kind DIY jewelry pieces? If you do, then check out these 26 Unique Halloween Jewelry Ideas + 4 Halloween Friendship Bracelet Patterns to wear for the Halloween season! It's not Halloween until you've sampled sugary snacks to your heart's content! Let these festive bites bake or cool while you're making your fabulous jewelry. You'll be ready to host the most spook-tacular Halloween party with these devilishly delicious Halloween food recipes. Make these easy Halloween treats for your kids to pass out in class or if you have ghoulish guests haunting your home on All Hallow's Eve.